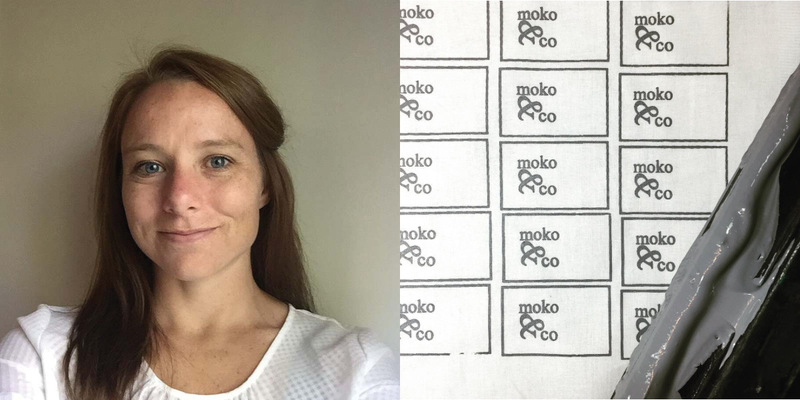 Meet Your Maker: Moko & Co.
For this edition we’re meeting maker Megan Granger from Charlotte, North Carolina business Moko & Company. 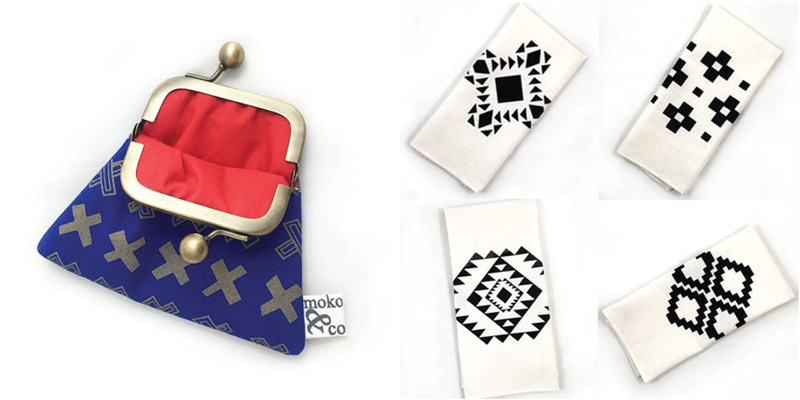 Moko & Co. makes vibrant, colorful, graphic and beautifully patterned bags and towels of all sorts. 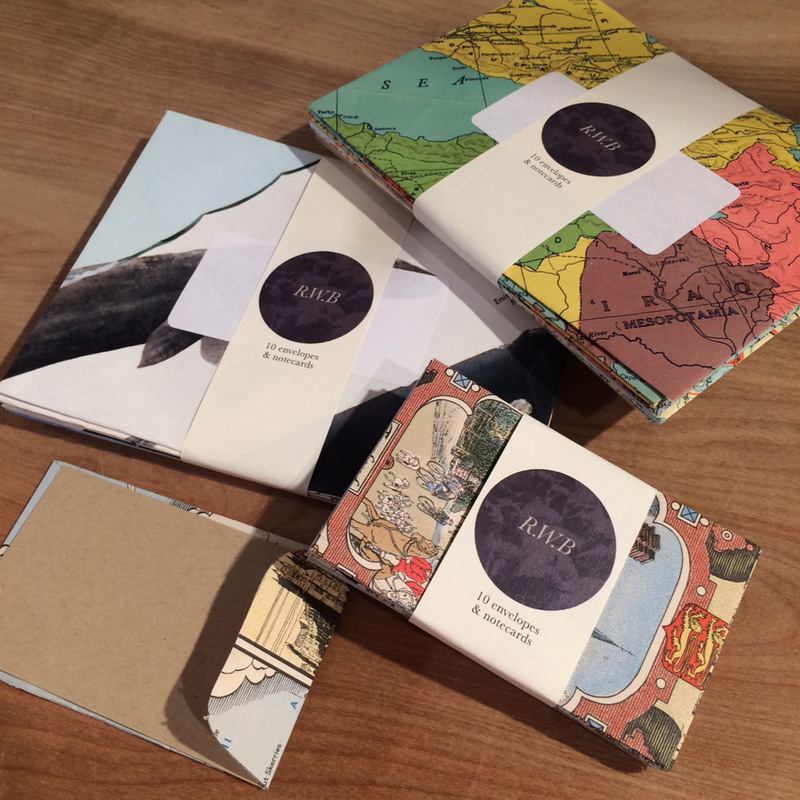 They even specialize in custom welcome gift bags for special events. 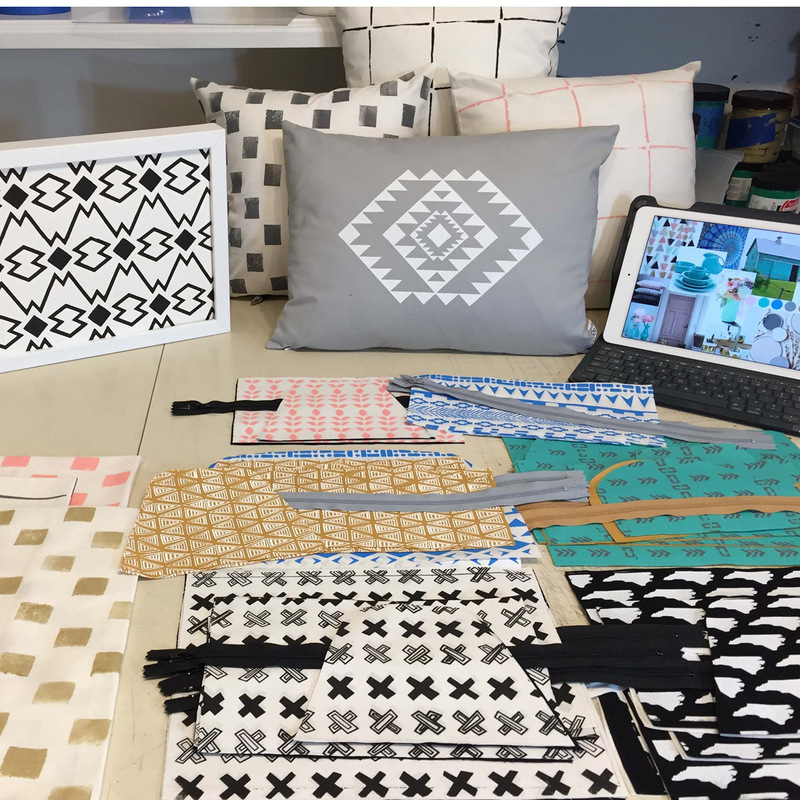 Find out how she got the courage to start her business, and take a peek at her delightful screen printed products. 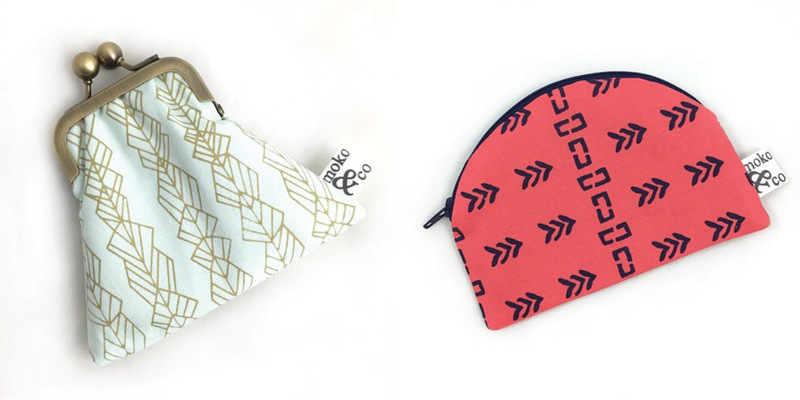 I explain that I design patterns and screen print them onto fabric then I sew them up into different pouches, clutches, and carry-its. Another facet of my business is wedding welcome bags that I design and screen print. I sell these through etsy and my website to brides/grooms to use as hotel gift bags. 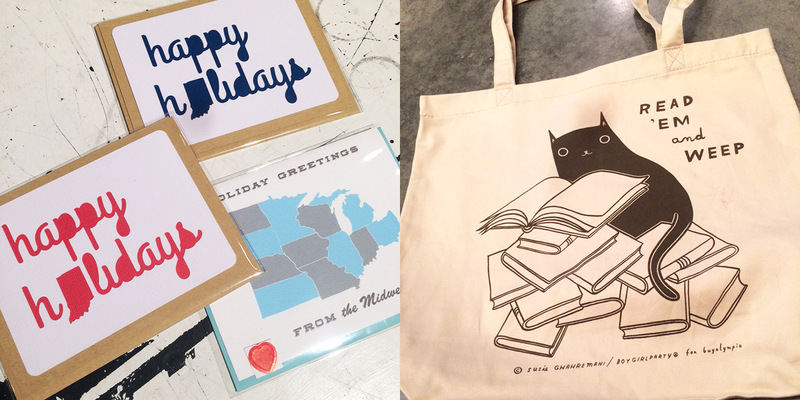 I also design and sell my totes through local retail shops as they are customizable based on location. 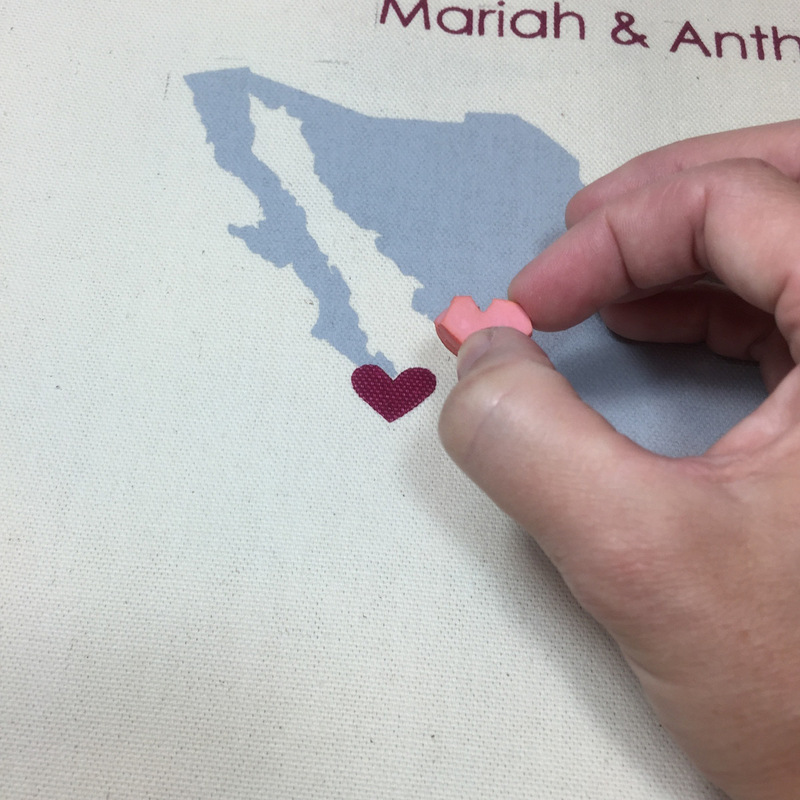 I print state silhouettes with the heart over any city onto totes and tea towels. I also can add text and custom color combinations, which is fun for stores and their customers. 2| I see you make pillows as well. 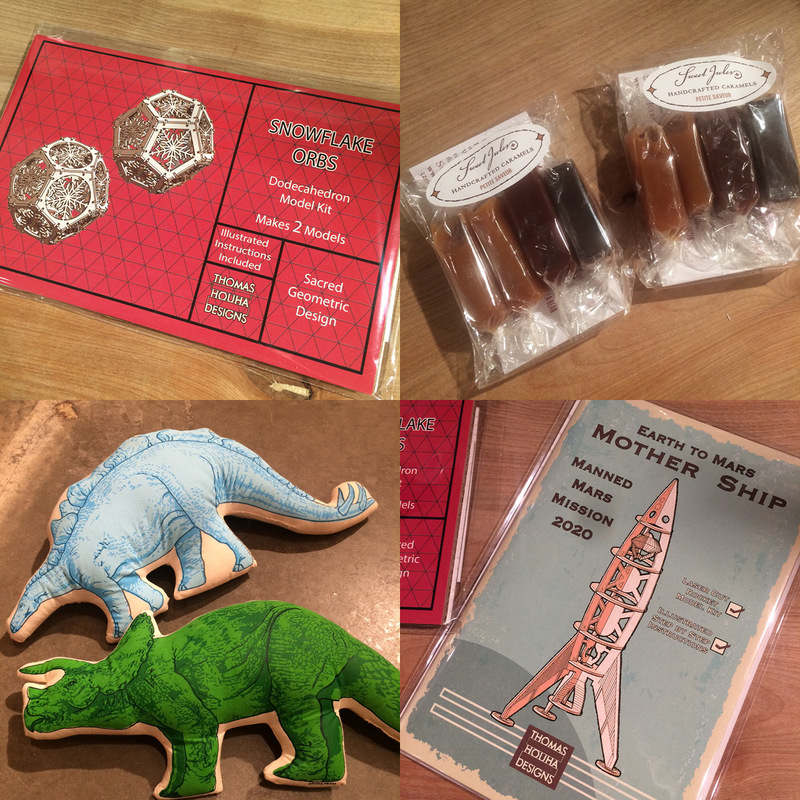 Any new product ideas in store? I’ve been playing around with hand painted fabric and a combination of screen printed fabric with hand painted elements. I’ve also been brainstorming and sketching out new tote bag designs. 3| Why do you make/design things? I’ve been making/designing since I was in high school when my sister and I started Moko & Company. 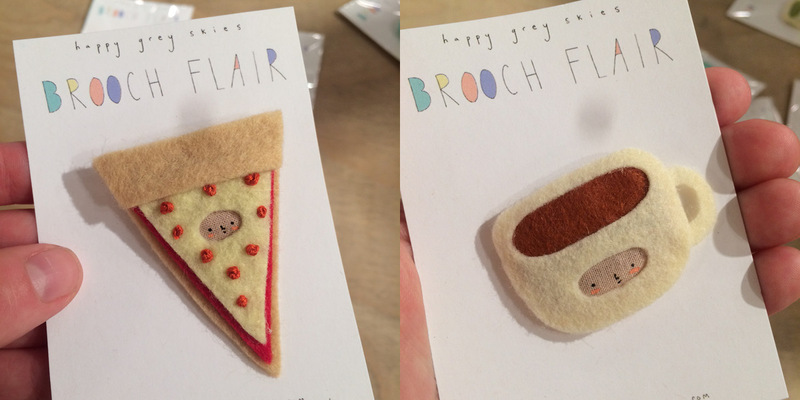 Our mom was always very crafty and always making and sewing so we followed her lead. Our process and products have definitely evolved since high school, but I guess you could say it’s always been a part of who we are to create. 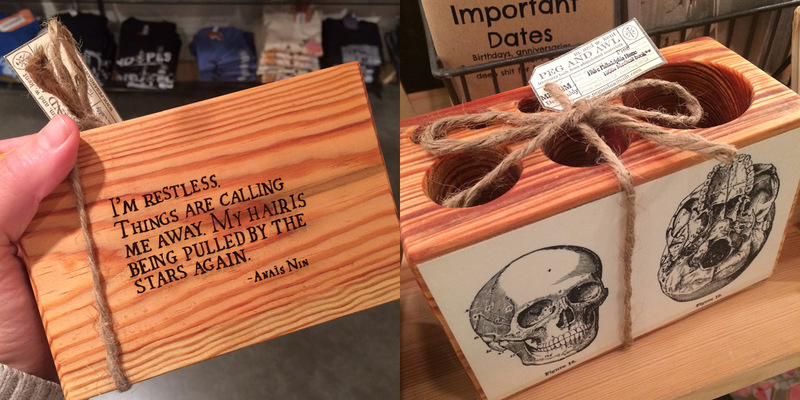 I love working with customers and retail stores to design custom products. Every time I screen print an image or a pattern I still get so excited to see it printed on the fabric or tote bags. 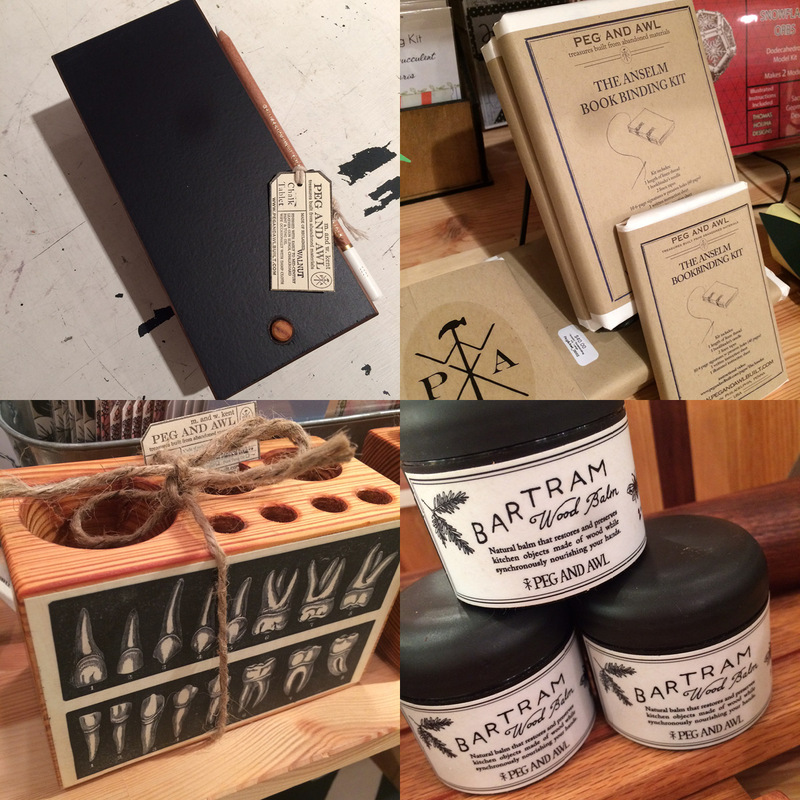 I love making customer’s visions come alive and creating one-of-a-kind products that are unique to them and their concept. I always worked creatively on the side, it wasn’t until we moved to Charlotte, NC and I attended the Maker’s Summit in Greensville, SC that I realized this interest and passion could be a full time career. 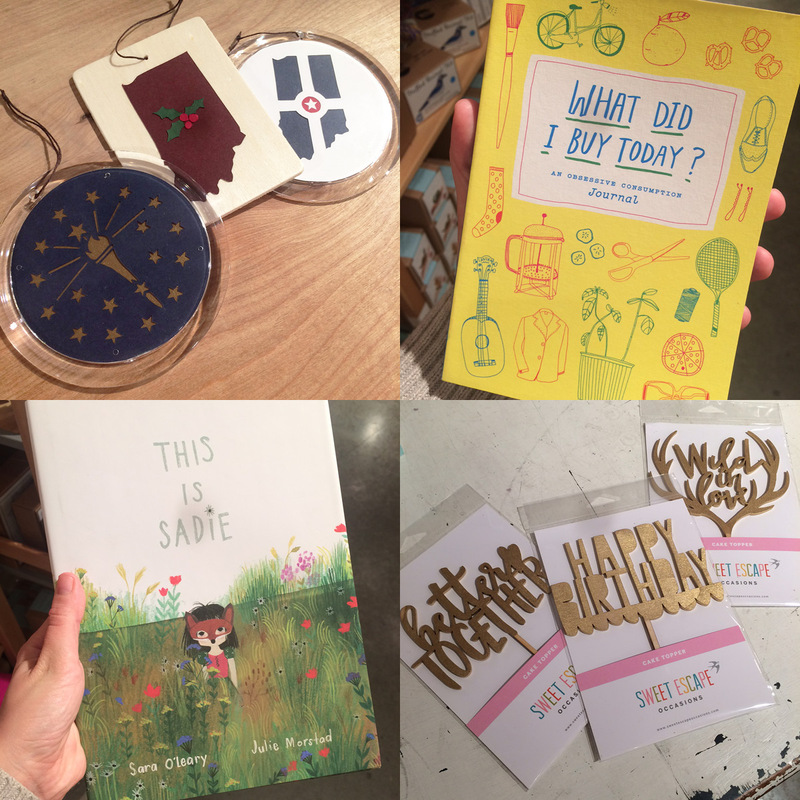 The Maker’s Summit gathered like-minded makers and made me feel less alone in my creative journey. I wasn’t the only one with a creative passion that wanted it to be a full time career and that was very comforting to me. I would say that was my “aha”/”I can do this” moment. 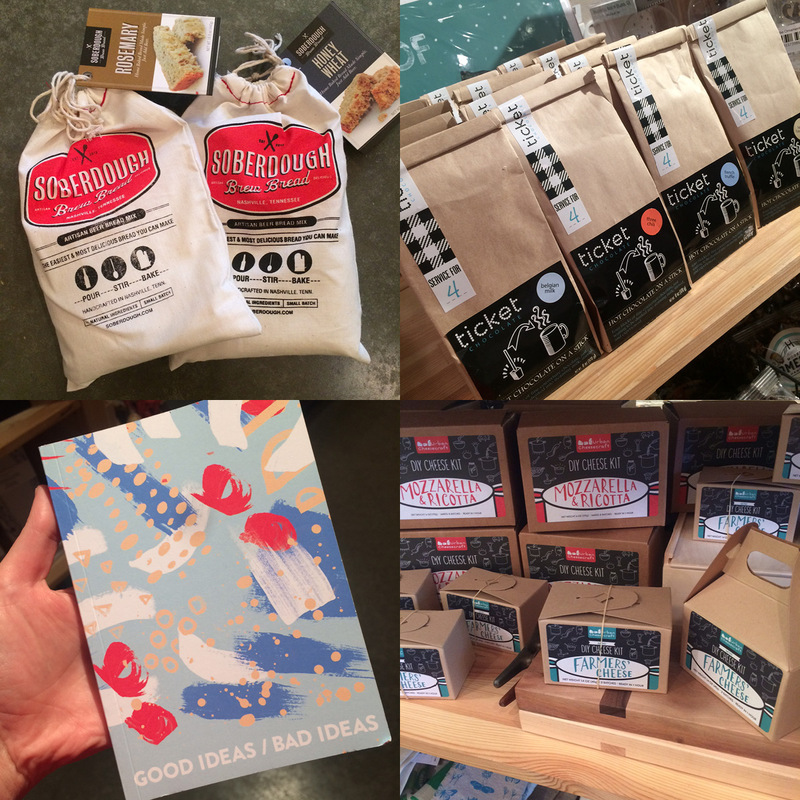 7| What are your inspirations when creating patterns and choosing color pallets? Whenever I am out and about I always have my eyes open for inspiring imagery and patterns I may stumble upon. I’ll take a photo with my camera and bring it back to my studio to sketch out some ideas and concepts that I turn into patterns. 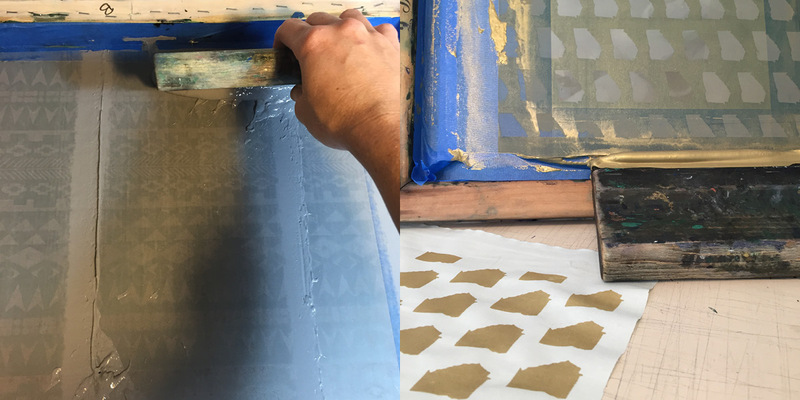 Some of my patterns I design by hand and transfer directly to my screen for screen printing. Sometimes I will scan them and manipulate them on the computer first. I love the limitations of screen printing fabrics because it forces me to choose colors wisely since I am limited to one or two inks. I’ll test out different color combinations of ink and fabric and then print the patterns using my favorite ones. Once I see the patterns printed in the color ways, I’ll choose which ones I want to proceed with and use for my products. I greatly admire Lotta Jansdotter. I was lucky enough to attend a workshop in her Brooklyn studio and I loved her space, her attitude, and her design style. 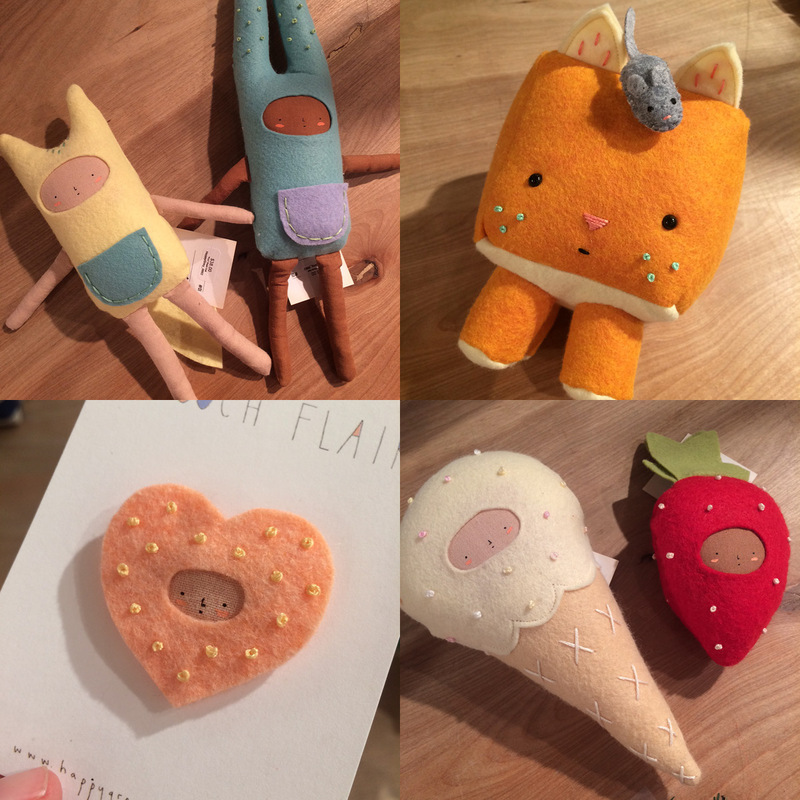 Handmade is extremely valuable because you not only receive a quality product, you receive a product with a story behind it. 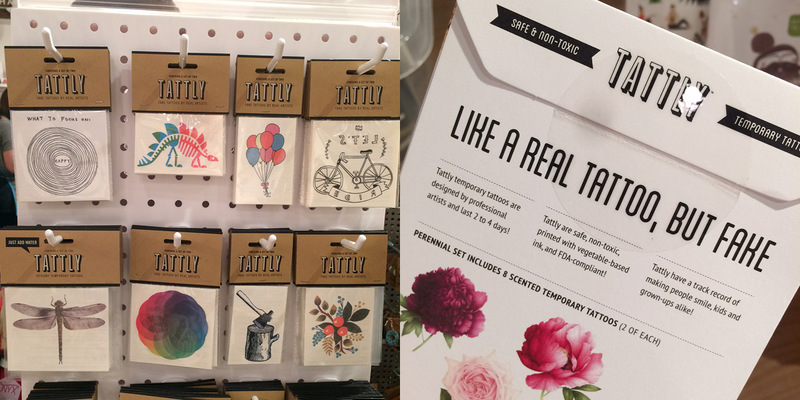 When products are made by hand they have a certain aesthetic to them that you can’t recreate through digital printing or machine made products. They have little quirks here and there that add charm. 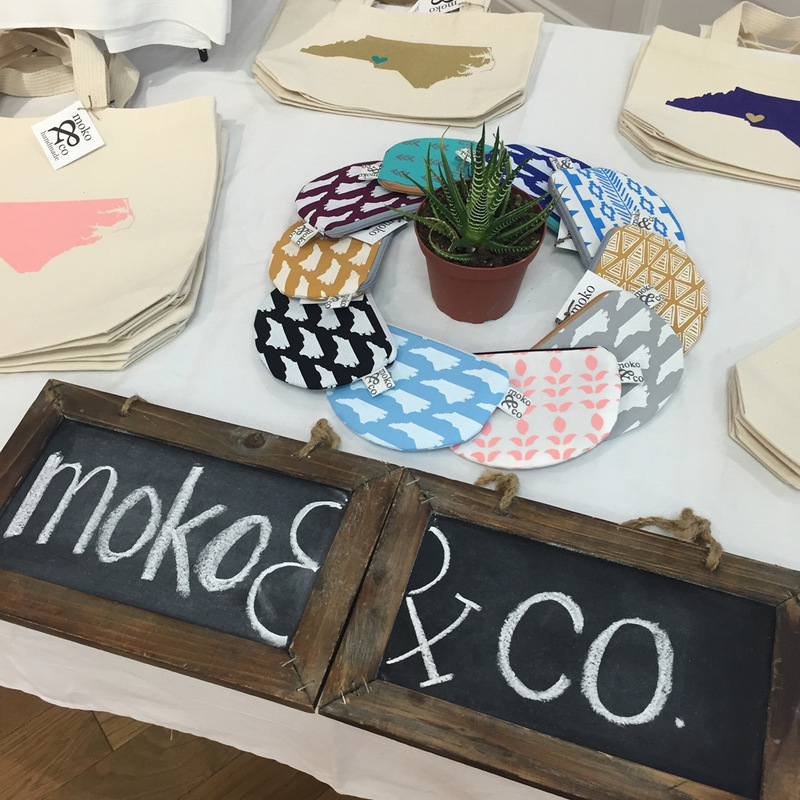 I love the handmade look of our tote bags. The ink we use is different than that of a commercial printer and you can really tell the difference. The ink is more absorbed by our totes and they become married together creating a really neat look. The most valuable object I own is a quilt I got up in Vermont at a little quilting shop. It is made with such love and care, the stitching is impeccable, and you can tell a lot of thought when behind the design and fabric choices. 11| What is the hardest part about owning your own business? The hardest part about owning my own business is making sure I’m not spreading myself too thin. It’s definitely important to prioritize and be organized to ensure everything I need to get done is getting done. Since I run a home-based business, it’s also a challenge to stop working because there is always “one more thing I could do.” I try very hard to take time for myself especially on the weekends and reboot. 12| Give us three more non-crafting-related details about you or your life. I’ve lived in Charlotte, NC for three years. We moved from up north and absolutely love it. We love the city of Charlotte and how much it is growing and thriving. We also love exploring the new area and driving to different cities and states to explore. We’ve been to Hilton Head, SC; Charleston, SC; Savannah, GA; West Palm Beach, FL; Asheville, NC; those are a few of our favorites! We love that we can drive all of these places from Charlotte. Next on the list is Nashville! If you’d like to see more of Megan’s work, check her out on her website, Facebook, Instagram, Pinterest, Twitter. 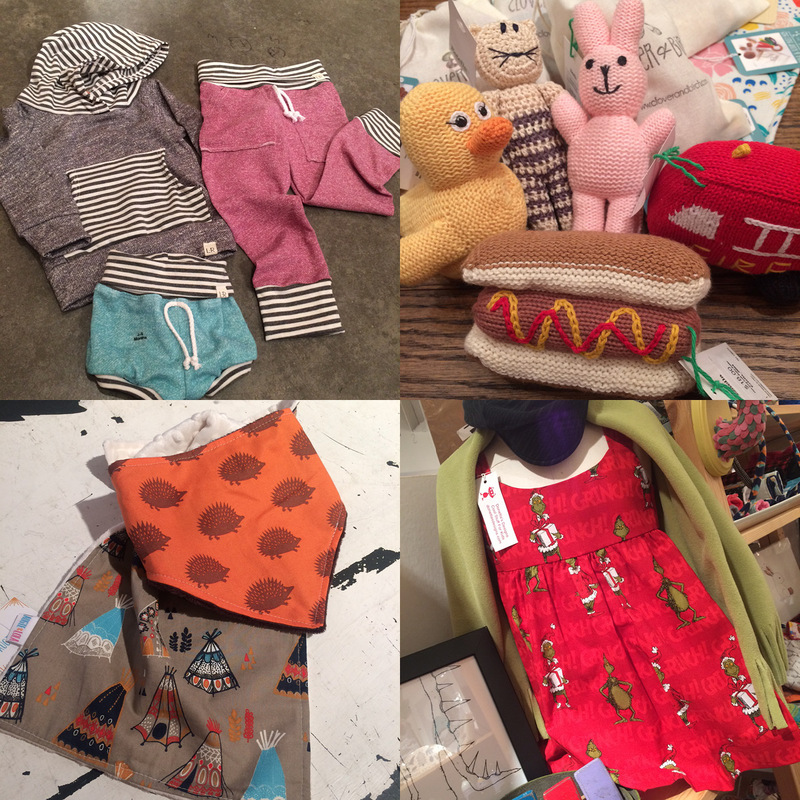 Or, of course, you can come on down to the East end of Mass Ave. and visit us here at Homespun Modern Handmade! We’d love to see ya. Pom-poms! 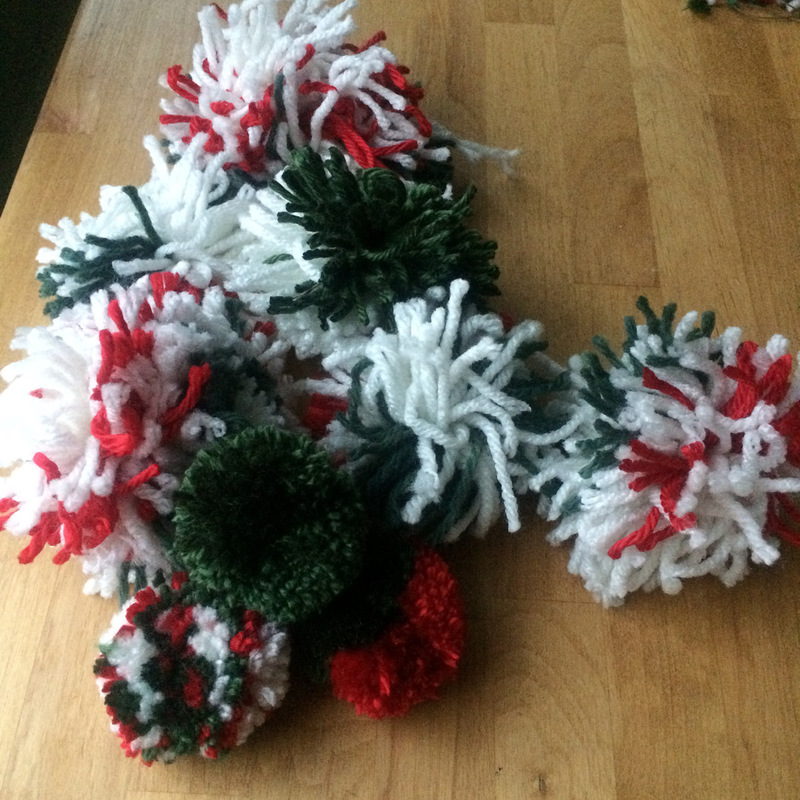 I was seized with the idea to make these as I was browsing through a high-end catalogue that boasted a holiday pom-pom garland. I thought it was so cute, so homey, and so beautiful. 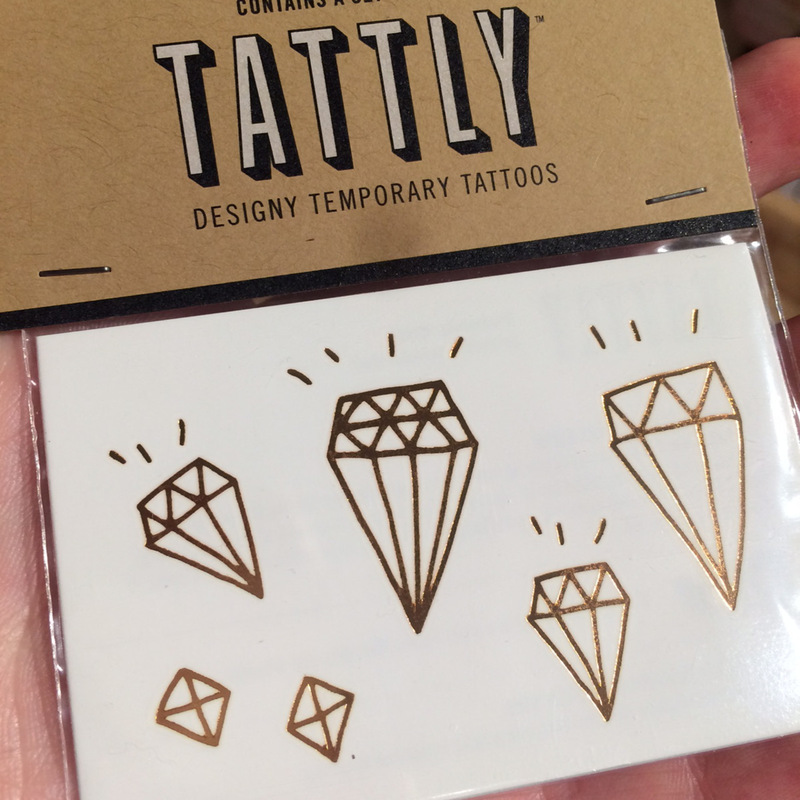 But that price tag! Then I realized, aren’t you the one who writes the HOW-TO blog for Homespun Modern HANDMADE? Yes. Yes I am. 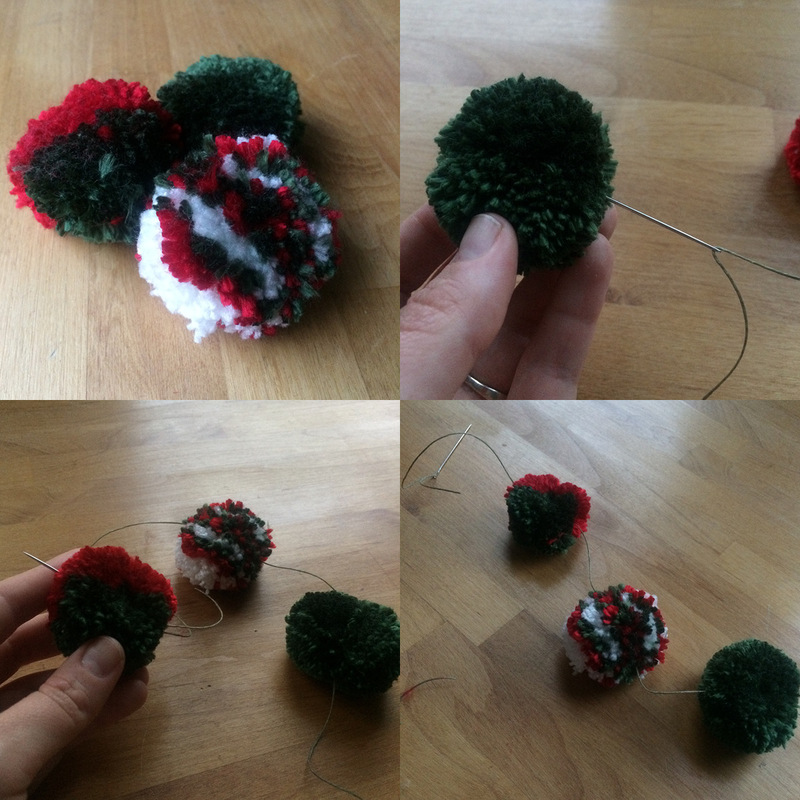 I can certainly make my own pom-pom garland. 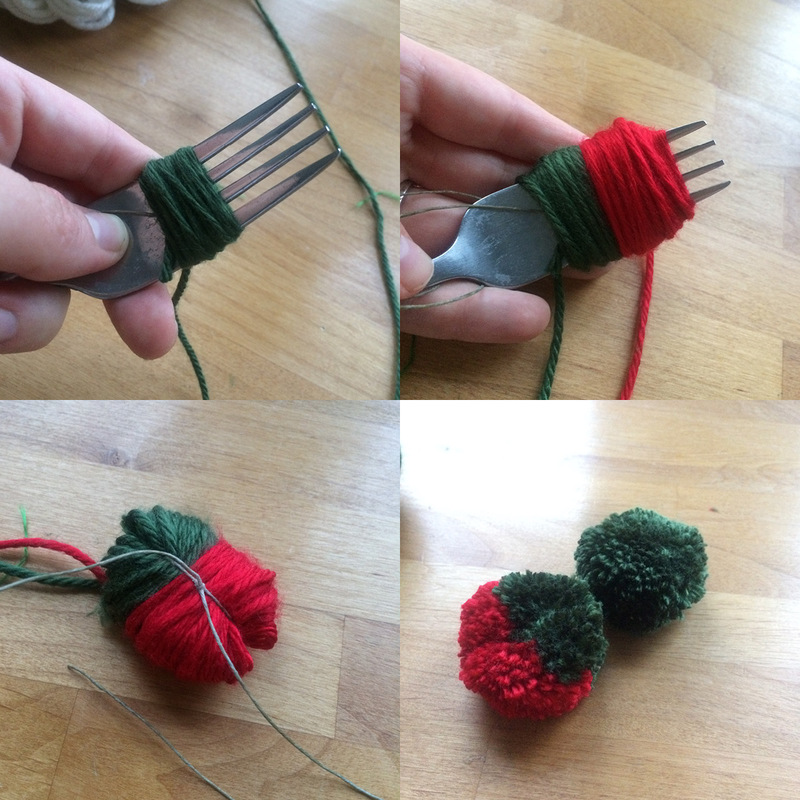 It’s so easy you’ll be thinking of a million other ways to use your pom-poms. 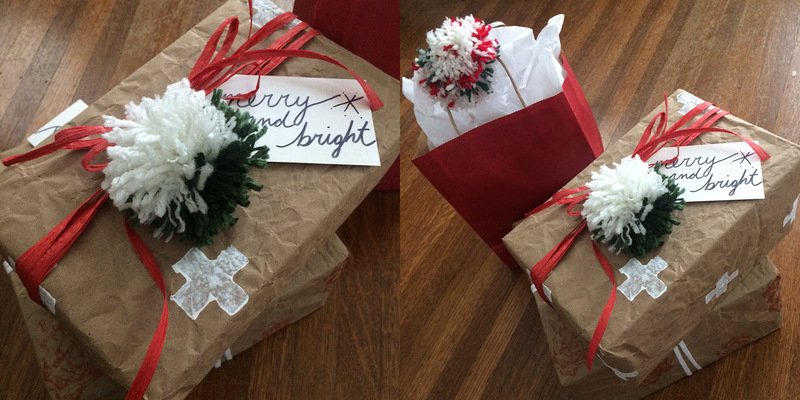 I decorated my gifts with them, you could add them to a pillow case or some curtains or the edges of a throw blanket. Add one on to your hand knit or store bought winter hat for a custom look. Tie a couple to your snow boots or slippers. Endless pom-abilities!! Ha…haaaa…. but really there are. Use any ‘ol yarn. To synch the pom-poms in the middle I am using some waxed linen thread. The wax helps the threads stick and gives me a tighter knot. However, you can use any string at all and using the yarn itself is perfectly acceptable. 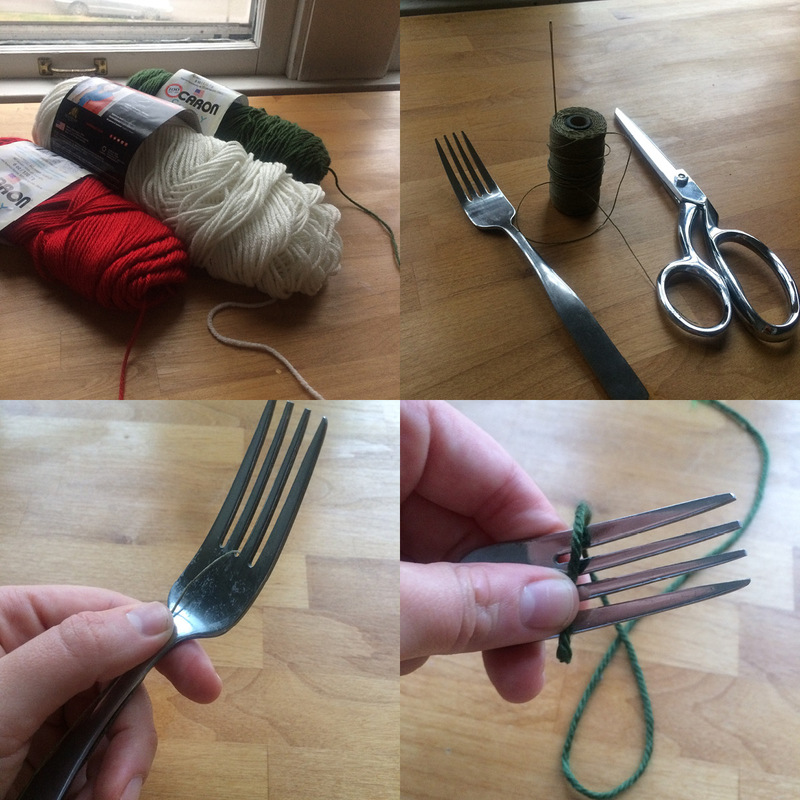 Place a length of string about 10 inches long in the middle of the prongs of a fork. Then get your yarn ready to wind. Wrap around until you’ve got a nice chunk of yarn on there. 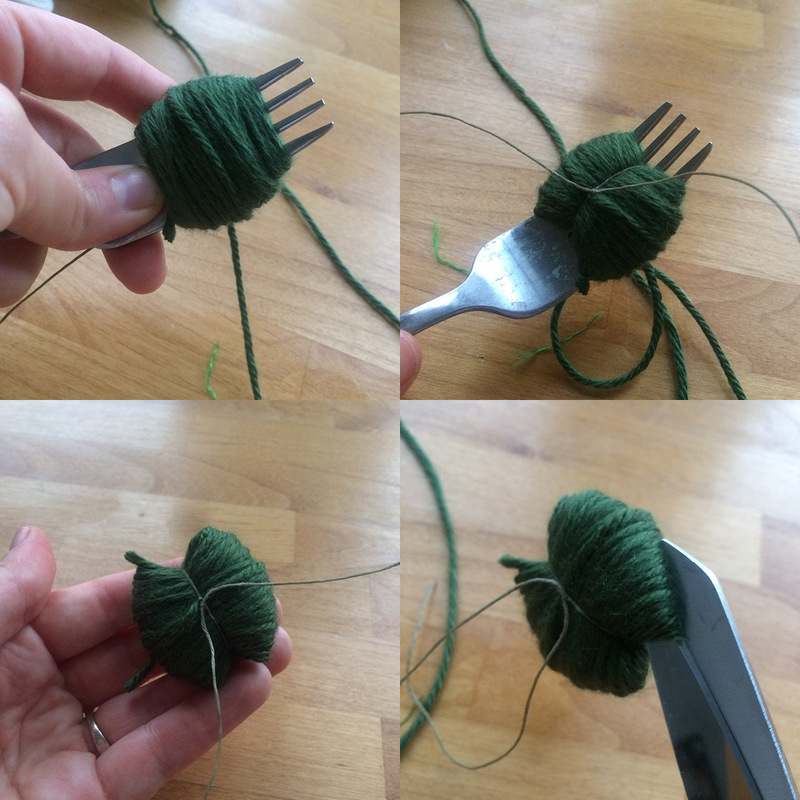 This was about 150 times for this yarn thickness/ fork size. Keep it manageable so it doesn’t run off the fork but dense enough to give you a nice tight pom. Then bring up the ends of your string and tie a knot as tightly as you can. At this point you can slide it right off. Grab a sharp pair of scissors and cut all the loops. After you’ve cut all the loops, floof the pom a bit and then begin trimming. In the bottom left photo you can see I’ve trimmed the right side of the pom but not the left. 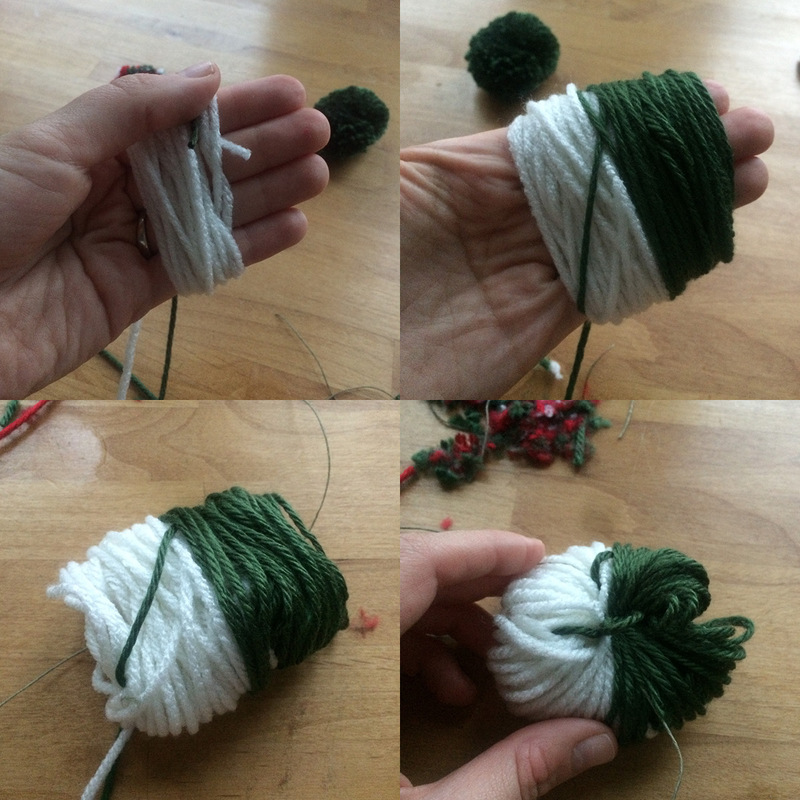 If you want to tie your pom-pom onto something else, be sure to leave the strings you tied it together with in tact. 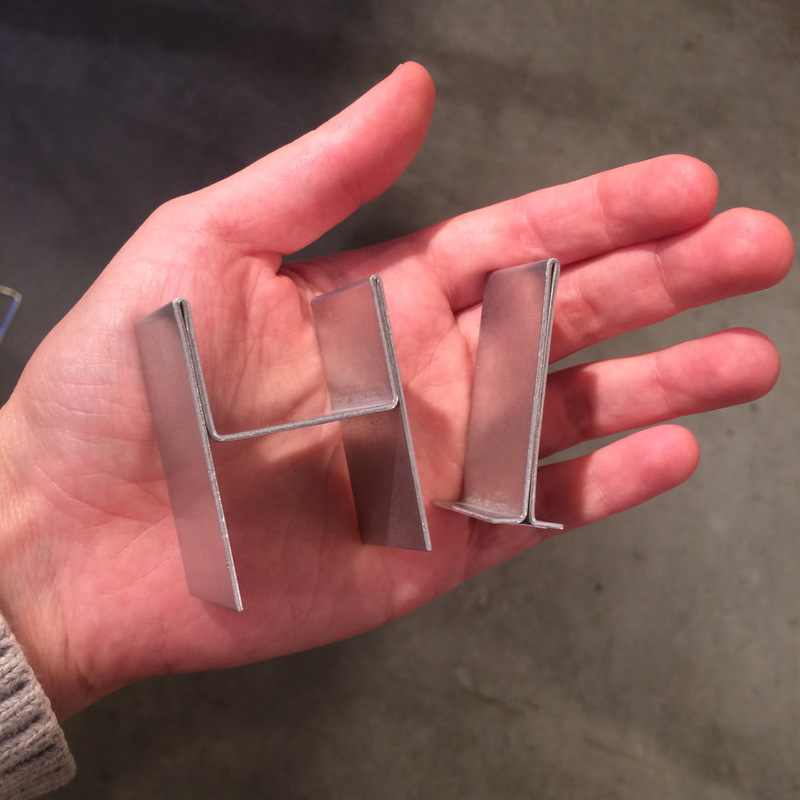 If you’re making a garland, you won’t need these. And wah-la! A pom-pom! 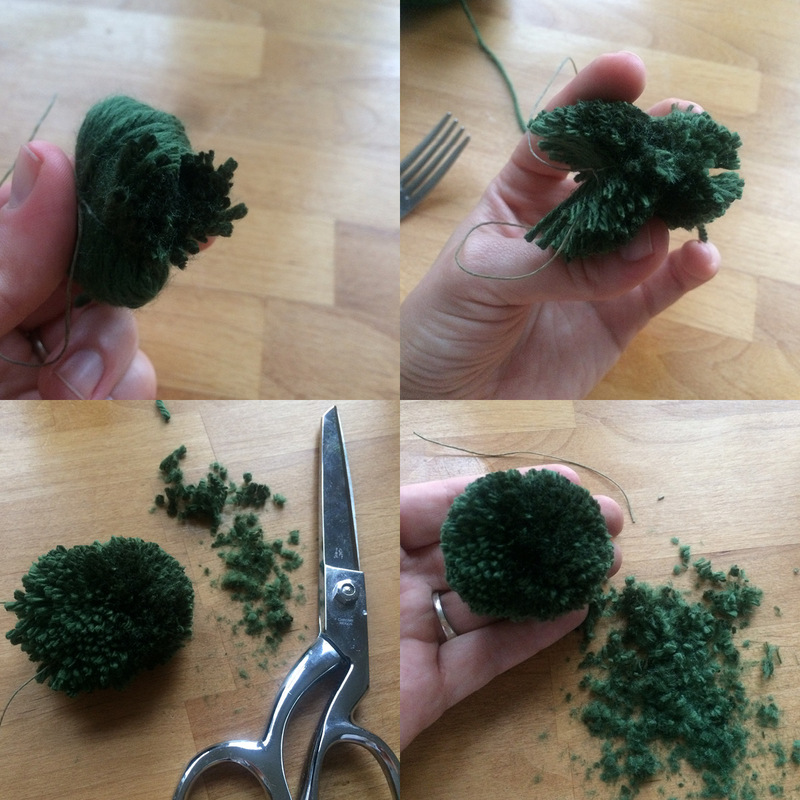 Making two or three colored pom-poms is easy enough. You can experiment with different ways of adding on new colors. 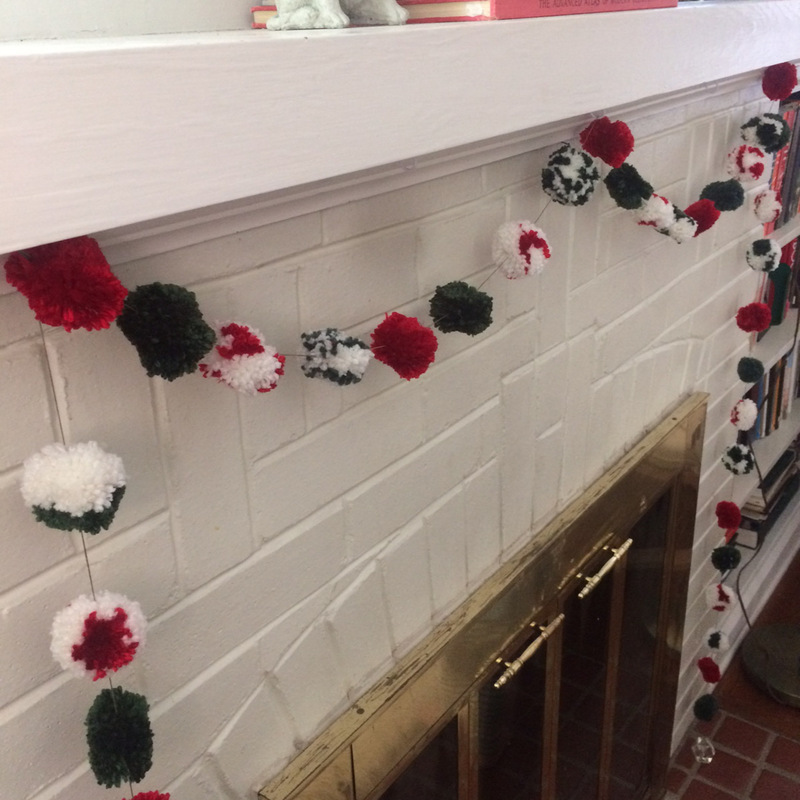 Here are a couple examples, and there are more in the images of my garland posted below. 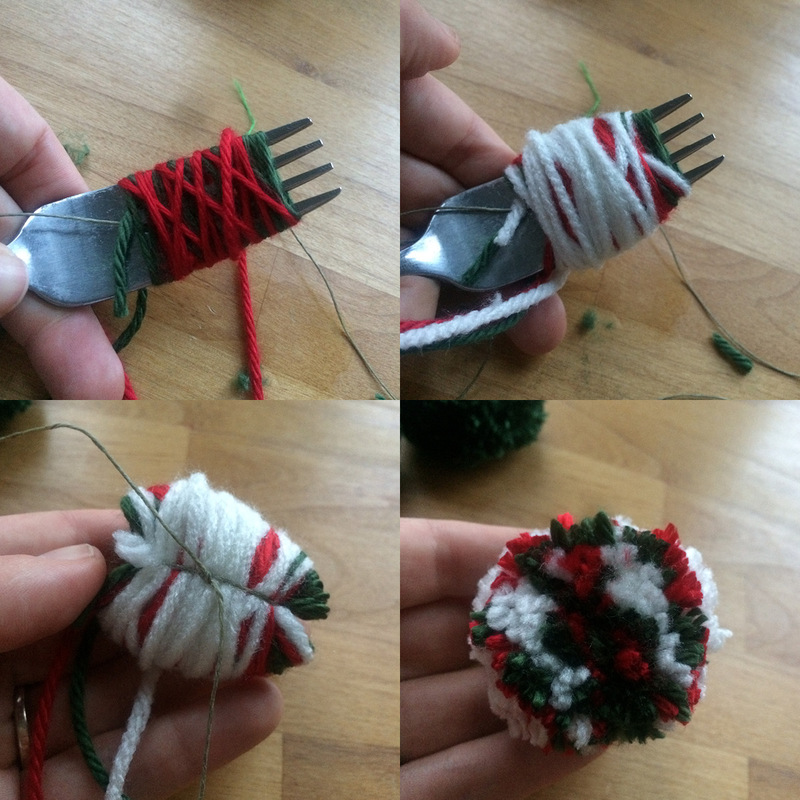 To make your garland, simply thread an oversized needle and push through the center (where you’ve tied the string) of the pom-pom. Space them as close together or far apart as you like! 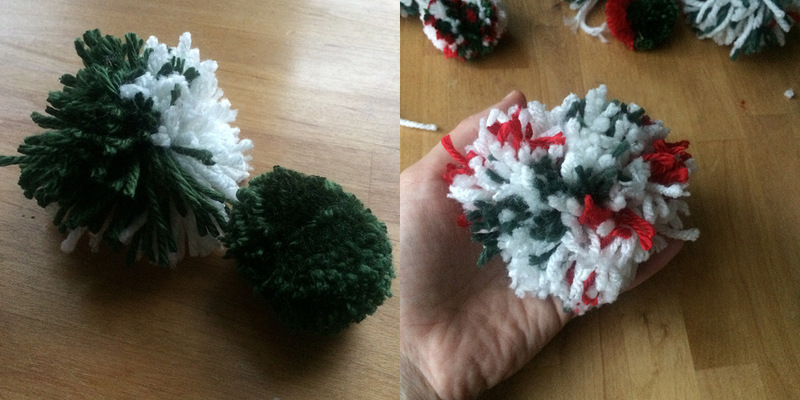 If you’d like a larger, looser pom-pom you can also make them with just your hands. Wind your yarn around your fingers, being careful to keep it from getting too tight or uneven. When you’re ready, just slip it off onto a piece of pre-cut thread and tie it around as close to the center as possible. 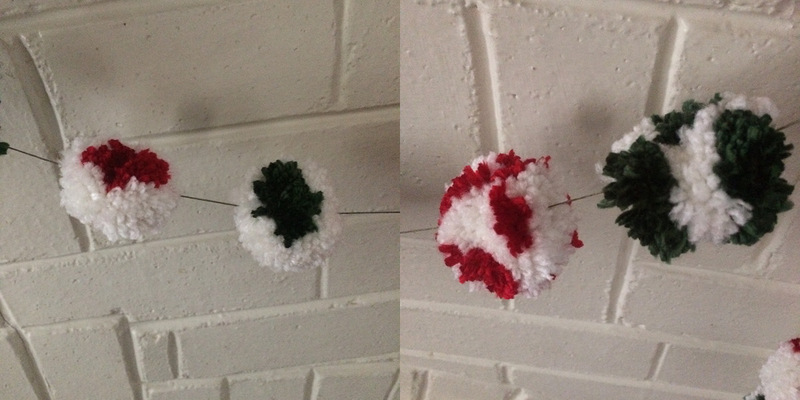 Here’s the finished garland and a few examples of different results from wrapping the yarn in different ways. I love it! 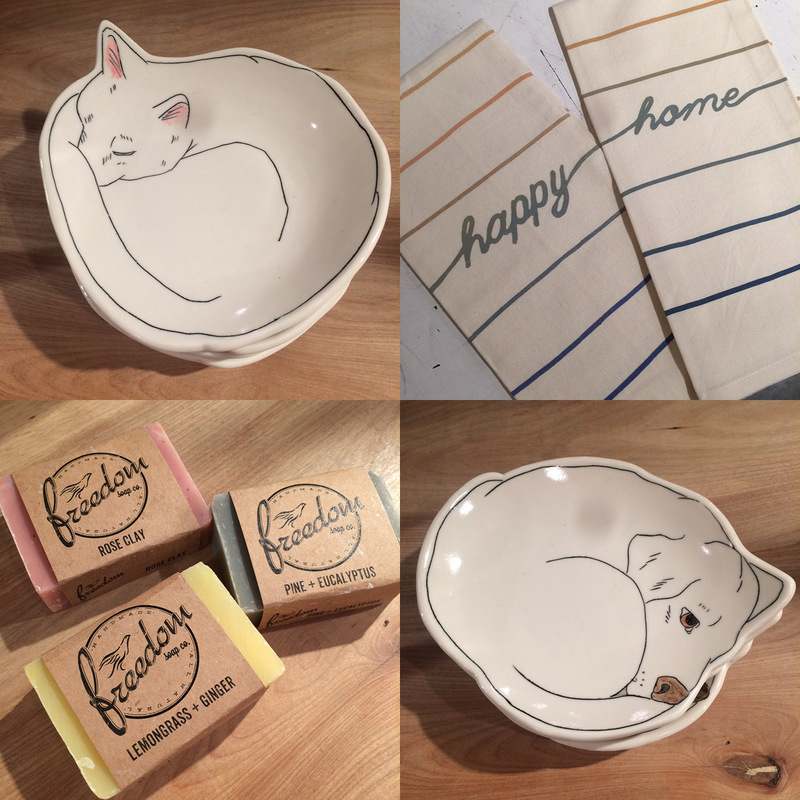 The perfect addition to your holiday gifts! That’s it! 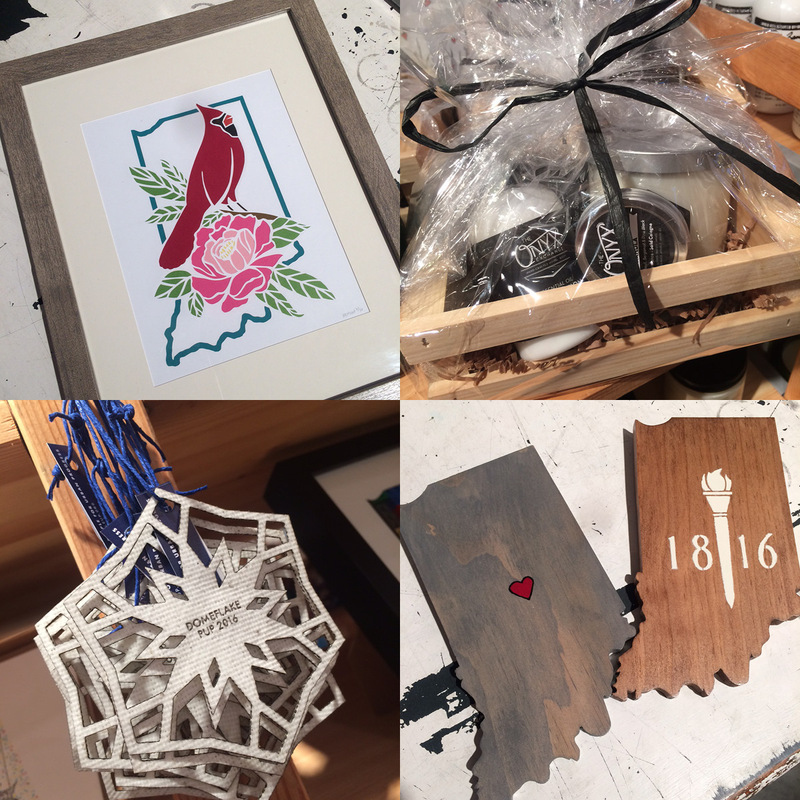 Be sure to share your creations with us on Facebook or Instagram, @homespunindy. Nothin’ like the first real snow fall of the year to make you realize it really IS December and it really IS time to get that holiday shopping done! 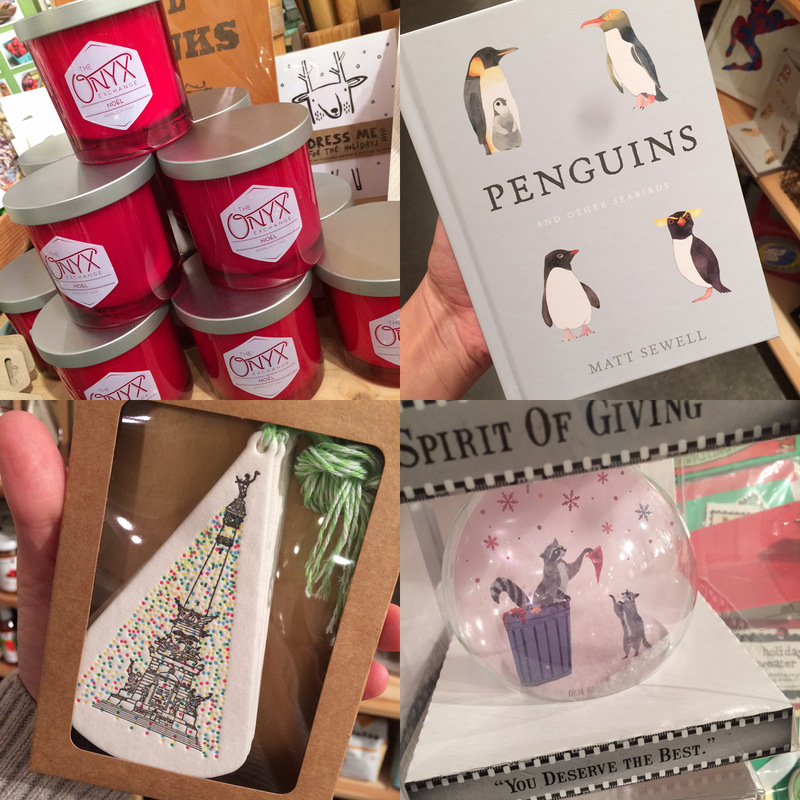 I’m here to show you a whole slew of new, beautiful things to check off (or add to…) your list. Come on out and see us sometime! 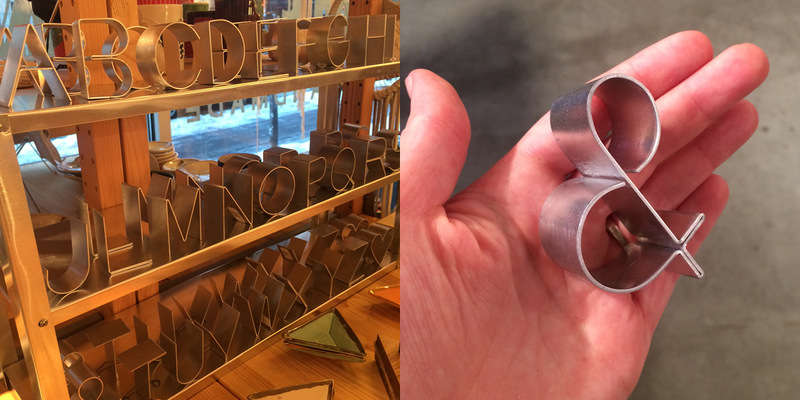 There are so many fun ideas for these 2″ metal letters by Gauge NYC. They can be used as cake toppers or home decor and are freestanding. 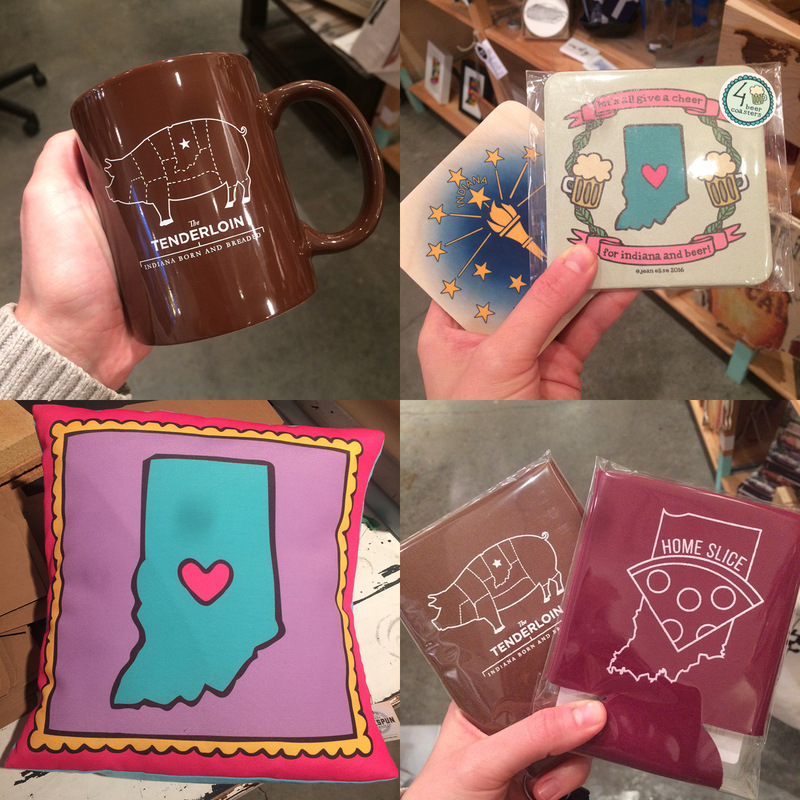 More Hoosier themed fun: mug and coozies by United State of Indiana, coasters by Decorative Design Works and Jean Elise Designs. Throw pillow by Jean Elise Designs. 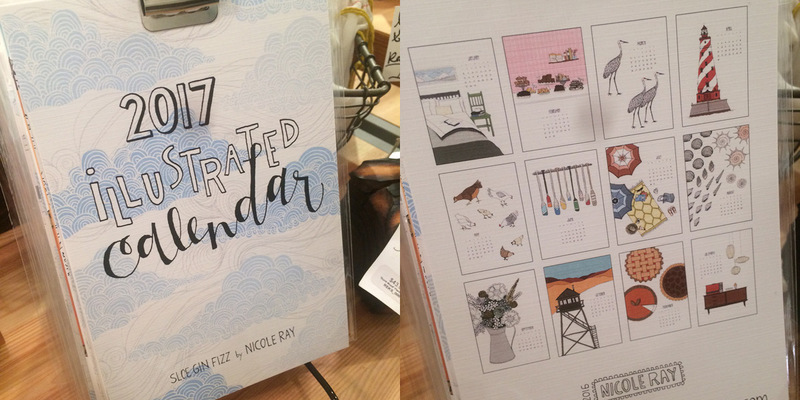 New 2017 illustrated calendar by Sloe Gin Fizz. 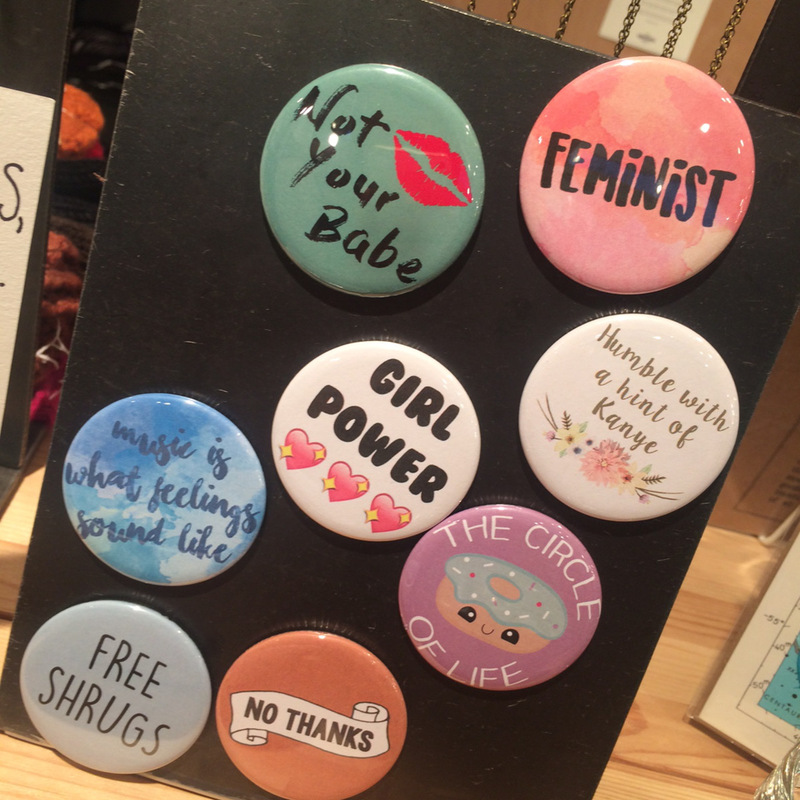 Pins, magnets and badges by Whitty Creations. 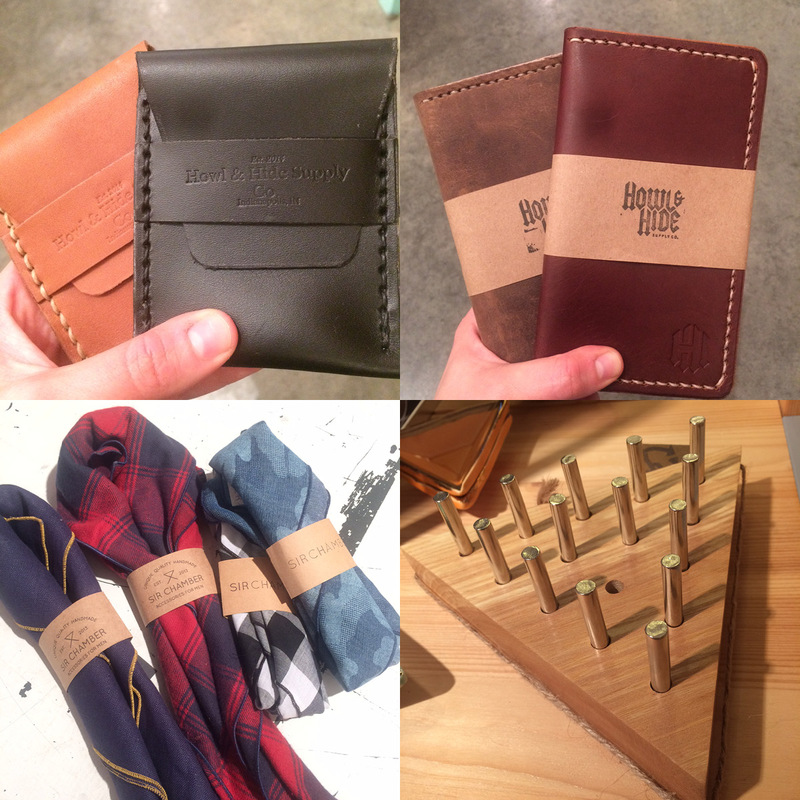 Restock from Howl & Hide leather supplies (these are so amazingly thick and well made), peg game by Re by Katherine Scott, and restock on Sir Chamber neckerchiefs, pocket squares, and bow ties. 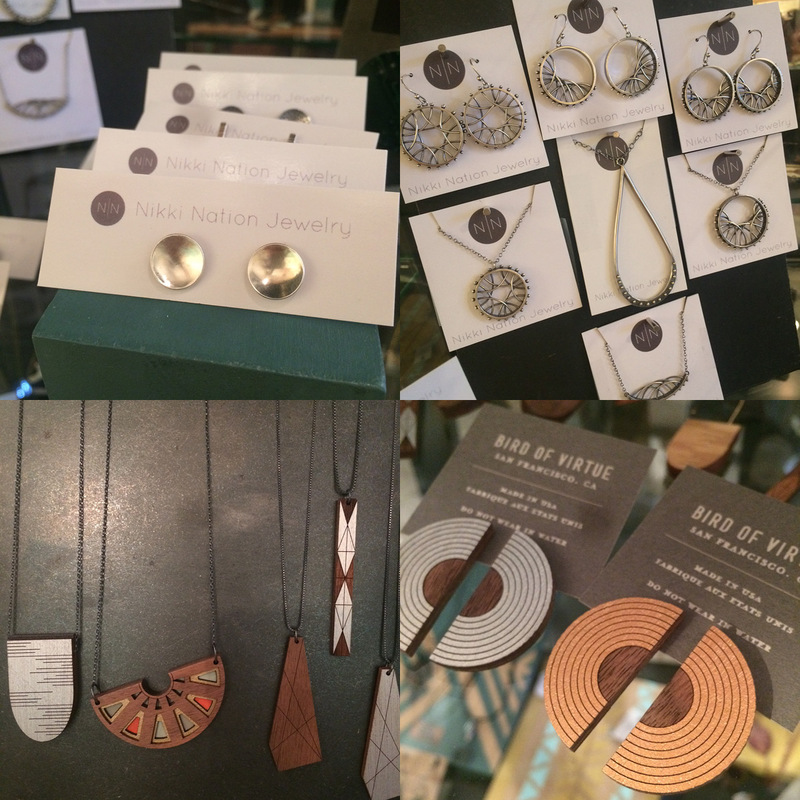 Beautiful new jewelry from new vendors: Nikki Nation Jewelry and Bird of Virtue. 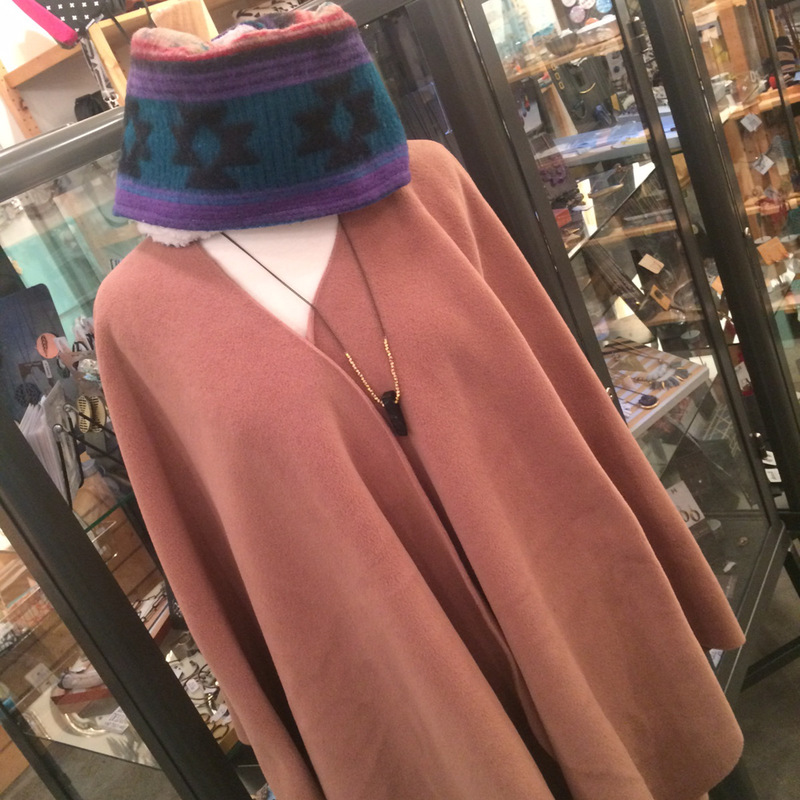 We’re cozy warm in a camel Cloque, infinity scarf by Nicole’s Threads and necklace by Larissa Loden.